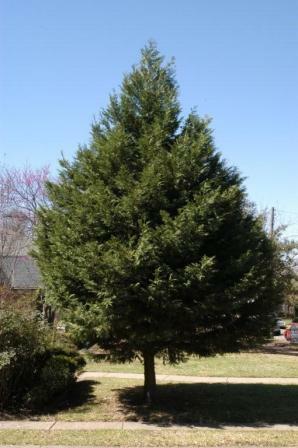 HABIT: Evergreen with pyramidal overall shape, moderate to fast growth. Looks the same year round. Soft foliage. CULTURE: Adapts to most well drained soils. USES: Background plants, evergreen screen, specimen. PROBLEMS: Root rot in poorly drained soils. Not a foolproof plant in Texas. Seiridium Canker – This destructive disease forms cankers on the stems, branches and branch axils causing dieback. Signs of Seiridium canker include scattered reddish-brown branches. Immediate pruning of diseased areas can help stop the spread of the disease. Cercospora Needle Blight – This fungus starts in the lower crown causing needle browning and then spreads upward and outward. Look for interior needles that turn yellow and then fall off, usually during October and November. Botryosphaeria Canker – (also Bot Canker) Leyland Cypress trees are at risk for this disease characterized by dead reddish-brown branches and twigs occurring in otherwise healthy foliage. Long, narrow cankers covered with tiny bumps may also appear on the trunk. This disease tends to attack trees that are already stressed by wounds, other diseases or insect infestations. Currently there are no chemical control measures recommended for the disease in the landscape or nursery. ANSWER: Probably too much. When in stress from overwatering, a fungus called Bot Canker attacks and kills entire limbs. Those limbs that have turned brown should be removed since they come back. Then apply the entire Sick Tree Treatment to the soil and plants. Make sure the trunk flares are visible and cut back on the watering. I would not recommend planting any more of these plants. This problem is becoming wide spread. QUESTION: I have lost about 20 of 50 leyland cypress. They have not been overwatered, i read your book. I understand there is a blight affecting them. I am willing to re-plant something else for a good visual break. ANSWER: I'd plant a mixture of yaupon holly, eastern red cedar, agarita, cherry laurel and magnolia. Introduced hollies that would work include Nellie r. Stevens, Wirt l. Wynn, and lusterleaf. The coppertone loquat might also be a good choice.